Credit: Photo by C.W. Benkman, University of Wyoming. RENO, Nev. – The South Hills crossbill, potentially a newly discovered species of finch, has evolved over the past 6,000 years with a unique dependence on its food source, the Rocky Mountain lodgepole pine, in a coevolutionary arms race that also changed the tree, according to a genomic study led by Tom Parchman, a biologist at the University of Nevada, Reno. The relatively quick coevolution occurred in two small Great Basin mountain ranges in southern Idaho, just across the border from Nevada. Unlike other migratory North American red crossbills, the South Hills crossbill is a permanent resident in this small mountain range, while other ecotypes regularly move through and even breed in the region. "In the absence of the usual top predator for lodgepole pines, the red squirrels that are superior competitors for the lodgepole pine seeds, the South Hills crossbill became the prime harvester of pine cone seeds," Parchman said. "The finch feeds voraciously and exclusively on the pine seeds, which caused the tree to evolve seed defenses that make it harder for the birds to harvest the seeds. "The birds counter-evolved against those defenses as evolution favored deeper-beaked crossbills, resulting in a coevolutionary arms race that has driven evolutionary divergence of this unique bird population." Parchman, who specializes in evolutionary and ecological genetics in in the University's College of Science, is the lead author on a recently published scientific paper in the journal Molecular Ecology detailing the study, a culmination of several years of work with his colleagues Alex Buerkle and Craig Benkman of the University of Wyoming, and Victor Soria-Carrasco of University of Sheffield, UK. Parchman has been studying the diversification and evolutionary genetics of crossbills here in the United States and in Europe. Among the things he found fascinating is that they are a group of finches highly specialized for feeding on the seeds in the cones of different conifer species that have evolved different beak morphologies despite a clear lack of geographical isolation. He and his collaborators present evidence that a coevolutionary arms race has led to genetic differentiation and is causing the evolution of a new species, perhaps over a remarkably short time period. The team studied the genetic structure of 9 ecotypes of the red crossbill. "A long history of research has sought to connect coevolution directly to the origin of new species, but none have been able to implicate as clear of a connection as we have here," he said. "Our study is one piece of the puzzle, one look at this coevolution. This is maybe the best and only clear example of reciprocal adaptation between two species contributing directly to the process of speciation (the formation of new and distinct species)." 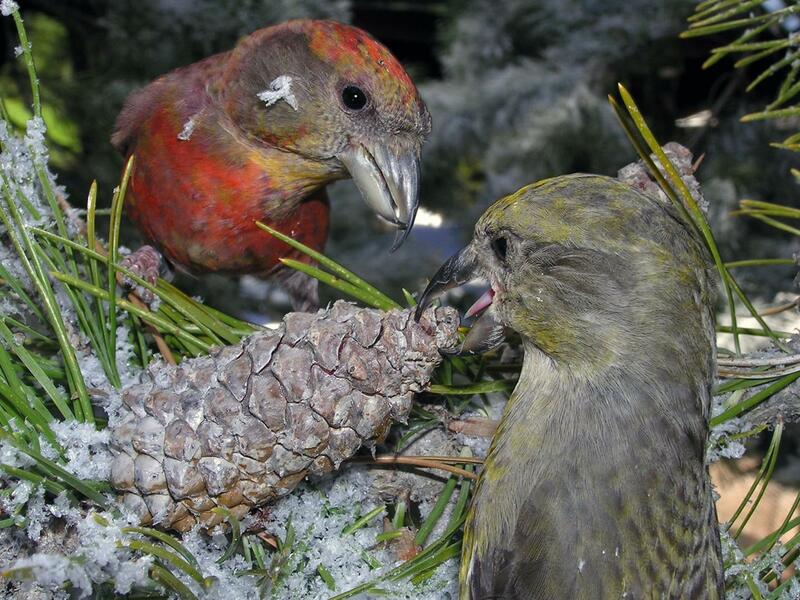 The genomic data in the paper contributes to a long history of research on the coevolutionary interaction between lodgepole pine and red crossbills in the South Hills of Idaho to produce one of the only well documented examples of coevolution directly causing the formation of a new species. The work relies on and complements the work of Benkman, who has spent his career, the past 30 to 40 years, studying these birds and their habitats. Parchman has worked with Benkman on these studies since 1999 when Benkman discovered the population. The small reddish birds congregate in small flocks, and the South Hills population is estimated to number around 4,000. The South Hills crossbills are resident – they don't migrate – while the other identified nine types often move through and use the area for breeding. The other nine ecotypes exhibit the usual nomadic tendencies engaging in movements of up to 1,800 miles in search of plentiful conifer cone crops. "Coevolution also occurs between other crossbill and pine taxa, but the South Hills crossbill has been studied in exceptional ecological detail," Parchman said. "We initially thought there would be interbreeding, but past studies by Benkman and his group suggested that the smaller billed, nomadic visitors, didn't seem to interbreed with the South Hills birds. Years ago we thought this coevolution could lead to genetic differentiation, but the genetic approaches of the time were costly, slow, and had very poor resolution. With today's new genomic technologies, we can now see fine scale patterns of genomic differentiation that we simply could not in the past." The colorful birds can be identified by their larger, deeper bills, but they also have different calls than the other ecotypes of crossbills. "Their vocalization, their flight call, is how we can categorize the crossbill ecotypes in the absence if information on their bill sizes." he said. "Our paper provides genomic evidence for the distinctness of this locally adapted population of red crossbills which could eventually result in the recognition of a new bird species, a very rare occurrence in North America," Parchman said. "Ornithologists are keenly interested in the potential new species designation, but more importantly there has been a decades-long interest in understanding the link between coevolution and the formation of new species, yet empirical examples with such evidence have been elusive. "This is one of the most unique crossbill lineages in the world but could be on its way to extinction," Parchman said. "Due to climate warming, we could be looking at their food resource declining over the next 100 years – or sooner if there's a catastrophic forest fire or a major bark beetle infestation. This may be a fleeting instance of coevolution influencing speciation, but we have observed enough of it to see that it can happen and may happen in other similar situations."